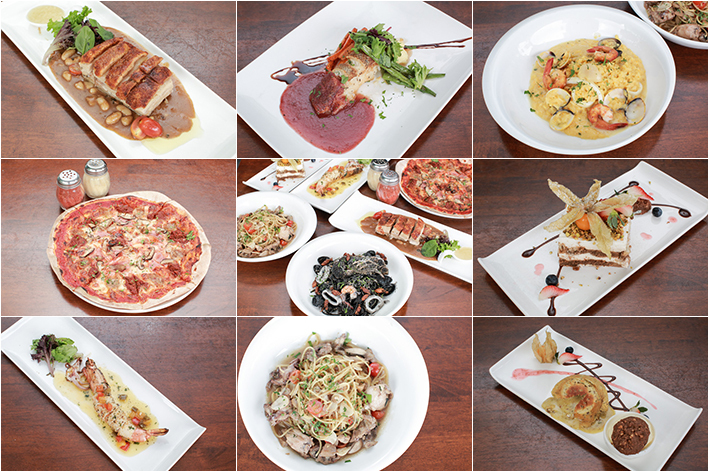 The Antipasti menu features a selection of classic Italian starters such as Calamari Fritti (S$18++), Carpaccio di Manzo (S$22++) and the excellent Calamari e Gamberoni (S$28++)—an entire squid, grilled to perfection with King prawn stuffing, garlic, butter, a few drops of lemon and a dash of white wine. Italians actually have their pasta as a starting course before proceeding to their mains, so the term “Primi Piatti” refers to first dishes. Although it is unlike our culture to have it as a starter, do not shy away from doing so; after all, it is only right we do the Italian way when in an Italian restaurant. 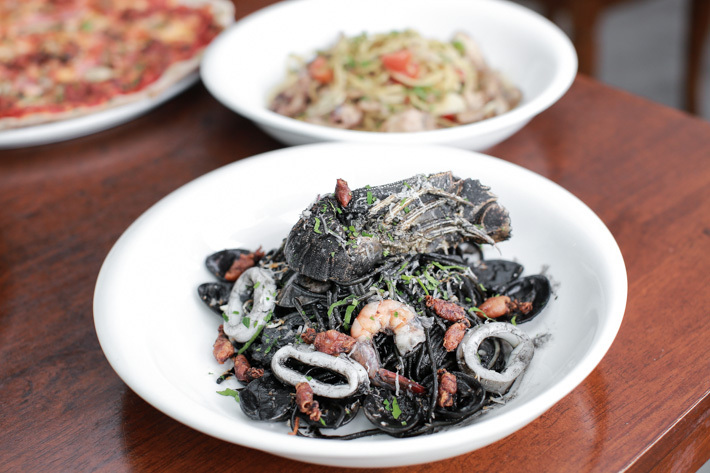 People often comment that it is a mistake to order a squid ink pasta on your first date, but we would do so anyway with the Spaghetti al Nero di Seppia (S$28++) because it is one of the best things on the menu. It comes fashionably with prawns, squid, scallop, clams and garnished with chilli. Other pasta that you can find on the menu include Spaghetti Aglio Olio e Fungi (S$18++), Linguine Alfredo al Frutti di Mare (S$26++) and Spaghetti alla Carbonara (S$18++). We Asians can never back away from our staple, even at an Italian restaurant. That is especially true at Pietro Ristorante Italiano, because the Risotto di Mare e Zafferano (S$28++) looks extremely fine. The risotto rice comes in a bright shade of yellow due to its buttery saffron cream sauce and has toppings such as prawns, clams, squid and scallop. There is a counter right at the end of the restaurant where you can watch the chef assemble your pizza before putting them into a traditional brick pizza oven. The Pizza Carnivora (S$26++) was served with edges slightly charred, but that’s how we love our pizzas. Generous chunks of mushrooms, ham, minced beef, homemade sausage, cherry tomatoes and mozzarella cheese were placed on top of the thin crust which was lavishly smeared with tomato sauce. The purists will enjoy the Pizza Margherita (S$16++) and Pizza Funghi (S$20++). For something more extravagant, go for the Pizza Prosciutto di Parma (S$32++). There are seven pizzas—including Pizza Margherita, Pizza Hawaiian, Pizza Romana—that you can get with the 1-for-1 promotion. The Pancetta Arrosto (S$24++) blew our minds. This is a roasted pork belly dish with the best crackling skin we can ever ask for; it was extremely crispy and falls into crumbs in our mouths. You will also find porcini mushrooms and kidney beans on the side, with apple sauce for dips. Now, listen up—no one steps out of Pietro Ristorante Italiano without trying this. That’s not all. You can also have the sublime Merluzzo (S$34++)—a perfectly cooked Cod fish with white wine, purple grapes and cherry tomato sauce; and the ever-popular Filetto di Manzo—grilled Australian beef tenderloin with red wine porcini sauce. From the Meat & Seafood menu, you can enjoy 1-for-1 promotion on the Pan-fried Salmon Fillet (S$26++), Rosemary Chicken (S$22++) and Crispy John Dory Fish (S$22++) with white wine sauce. Forget about your usual chocolate lava cake. At Pietro, there is a Tortino di Cioccolato al Pistachio (S$15++)—pistachio flavoured lava cake so well done that all it takes is just one cut on the cake to unleash the warm pistachio flood. It is paired with a scoop of vanilla gelato, and when eaten together, everything is just a creamy goodness that is unbelivable. Another popular dessert item is the Tiramisu al Pistachio (S$14++). Yes, the tiramisu is filled with layers of Mascarpone cream for the sweet tooth! This one has strong espresso coffee flavours with a subtle hint of pistachio taste. From now until 15 December 2016, our readers can quote “ladyironchef” to enjoy 1-for-1 antipasti, pasta and pizza (on selected dishes) at Pietro Ristorante Italiano. The promotion is valid from Mondays to Thursdays (lunch and dinner), as well as Saturdays (lunch). This post was brought to you by Pietro Ristorante Italiano. Hey Lady iron chef! Have the winners been chosen?